Students in the New Media Institute at Grady College are known for working on cutting-edge technology projects. There are few projects, however, that have as short a turn-around time to incorporate new features of a new operating system as the UGA sticker pack developed for UGA Athletics. 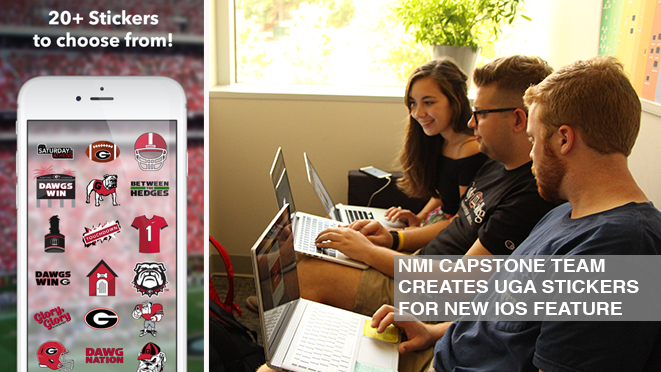 Four students working on a NMI capstone team launched the UGA sticker pack in the Apple ITunes store Sept. 13, the day the new iOS 10 operating system was available to consumers. They had about one month to develop the project. “It is pretty exciting that this team made something in just over a month that’s going to be available to a user base of over a billion devices,” said John Weatherford, lecturer in the NMI. A feature in the messaging app of the new operating system allows users to attach stickers, or graphics, to text messages and pictures. Knowing about this new feature in advance, the team worked with UGA Athletics to create a theme pack for UGA football. The team includes Emily Greenwood, a fourth year public relations major; Reilly Megee, a fourth-year advertising major; Sam Moran, a fourth-year marketing and management major from Terry College; and Ian Webb, a third year advertising major. The idea of creating the stickers for UGA Athletics came from Weatherford when he attended the Layers conference for iOS and Mac design in San Francisco this past summer. Once he returned to Athens, Weatherford arranged a meeting with UGA Athletics to propose the idea. After UGA Athletics signed off, Weatherford assigned the project to the team, which had about one month to get it ready for the day that the new operating system launched. Jen Galas (MA ’12), associate director of digital services for social media at UGA Athletics, was instrumental in helping the students complete the first stage of the UGA sticker project. The students, who are all earning their NMI certificate and are required to complete a capstone course solving a technology challenge for a real client, were up for the challenge. More than 20 stickers, including two animated graphics, are offered in the first pack and feature familiar graphics to UGA football fans: a football with the Georgia “G,” variations of the bulldog, phrases like “Between the Hedges” and Uga’s dog house, just to name a few. The first sticker pack was created using an off-the-shelf design program with graphics created in Photoshop and Adobe Illustrator, but there are future plans to add expansion packs with custom-built designs for additional football images and other UGA sports. Other potential ideas the NMI team plans to pursue are game day stickers for specific opponents and special graphics for the Georgia-Florida rivalry. “Anytime you can make a graphic specific to get people talking and put the ‘G’ and our brand on their conversations outside of the stadium, that's a really interesting way to keep that conversation going,” Galas said. The biggest challenge in getting the project done was taking what is normally a semester-long project, and condensing it into a month to meet the timeline. “I think the very quick turn-around was a little daunting but we powered through and we have app on the app store on release day,” said Webb proudly. A further challenge with the timeline was the fact that Greenwood had the unique opportunity of covering the Paralympics in Rio de Janeiro with Grady Sports Media, taking her out of the country several days prior to launch. The New Media Institute at Grady College is an interdisciplinary certificate program dedicate to exploring the critical, commercial and creative dimensions of digital media technology, including personal media like mobile, social and gaming. Students earning their NMI certificate are required to complete a capstone class where they work with real clients to solve a technology need. For more information, please search for “UGA Stickers” in the Apple ITunes store or visit UGAStickers.com.